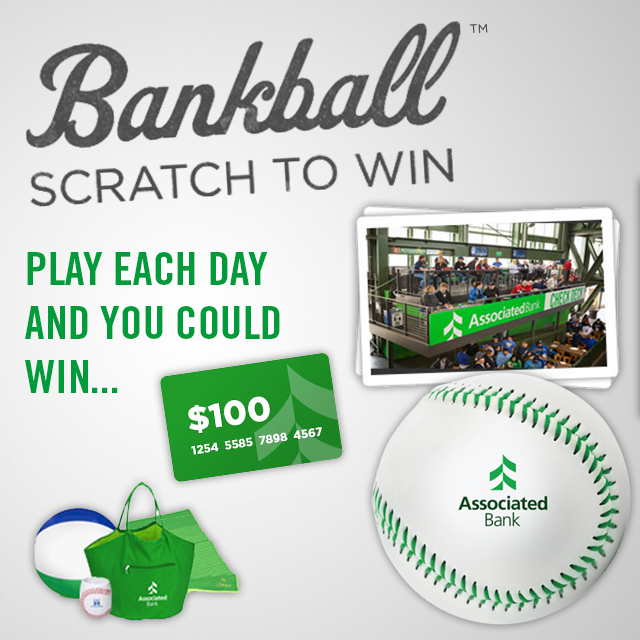 Associated Bank recently launched Bankball™, a fun and interactive digital game where fans will have a chance to win great baseball experiences and prizes through September 15th. Baseball fans for any team can participate in the game by visiting the mobile-friendly website at www.bankball.com and touching the screen to see if they instantly win daily prizes. Players are automatically entered into a grand prize drawing each time they play. Daily Bankball winners will be selected to receive Associated Bank baseballs. At the end of the season, nine grand prize winners will be selected to receive four exclusive Associated Bank Check Deck tickets, a parking pass and convenient access to the new Associated Bank "Check In" gate for the October 4th Milwaukee Brewers vs. Chicago Cubs game. Each ticket to the Associated Bank’s new Check Deck includes a unique experience with premiere seating just above the Brewers bullpen, an "all you can eat" buffet, two complimentary draft beers per adult, a private bar and flat screen high definition TVs. In addition, 20 second prize winners will be selected to receive a $100 gift card to their team’s fan store and 50 third prize winners will receive an Associated Bank summer party package (includes a beach bag, beach towels, beach ball and baseball-themed can koozies). "Bankball is a unique game designed to enhance fan engagement as part of Associated Bank’s ‘Love of Baseball’ campaign," said Christopher Piotrowski, EVP and chief marketing officer at Associated Bank. "All fans can participate in Bankball on a daily basis throughout the season and have a chance to win great prizes!" Associated Bank offers other unique benefits to fans. They can challenge their batting skills and receive great giveaways by participating in our interactive Home Run Challenge game behind section 113 at Miller Park. Fans can also open a Brewers™ Checking account and receive a limited time $100 bonus offer* for new customers, 2-for-1 ticket discounts on select games, 10% off Majestic team store merchandise, Brewers checks and debit card, as well as exclusive access to the Associated Bank "Check In" gate. ** For more information, visit www.associatedbank.com/brewers100. * Offer expires October 31, 2015. Minimum deposit required to open is $100. Deposits from existing accounts do not qualify. Customer must complete a minimum of three payments using Online Bill Pay OR have one direct deposit of $300 or more to their account within 45 days. Bonus will be deposited into their account within 75 days of account opening after meeting the qualifications. Customers with an Associated checking account in the last 60 days, joint owners on an existing Associated checking account and Associated Bank colleagues are not eligible. Account must be open at the time the bonus is paid. Popmoney® and transfers to external accounts do not qualify for the required transactions to receive the monetary bonus. Exclusions apply. Customer must be 18 years or older to qualify. Offer limited to one per household, cannot be combined with other offers and is subject to change (at Associated Bank’s discretion) at any time without notice. For tax reporting purposes, a 1099 may be issued at year-end for the year in which the bonus is given. ** Show your Brewers check or debit card when making a purchase or entering the gate.